Properties within the County are valued by the Property Appraiser’s office as of this date each year. Residency and ownership must be established as of January 1st to qualify for Homestead and other Exemptions and Classifications. Renewal notices mailed out to all Real Estate and Tangible Personal Property Owners. Deadline for filing an application for Homestead and all other property tax exemptions or classifications. All Tangible Personal Property returns or Extension request must be submitted or post marked by the close of business day in order to receive the $25,000 exemption. Denials of Exemptions or Agricultural Classifications are sent, out around June 1st, but no later than July 1st. Property Appraiser certifies values to all Taxing Authorities and Department of Revenue. TRIM Notices (Tax Notices) are mailed to all property owners. The Property Appraiser’s office conducts a “Review Period” and at this time additional resources are dedicated to providing taxpayers with an explanation and review of their assessment. Differences of opinion on value and any discrepancies should be discussed with the Property Appraiser at this time. Owners have 25 days from the mailing of TRIM notice to file a petition with the Value Adjustment Board. Deadline for filing petitions to the Value Adjustment Board (VAB) – 25 days after the mailing of the TRIM notice (tax notice). Property Appraiser certifies the Tax Roll to the Tax Collector and Department of Revenue. 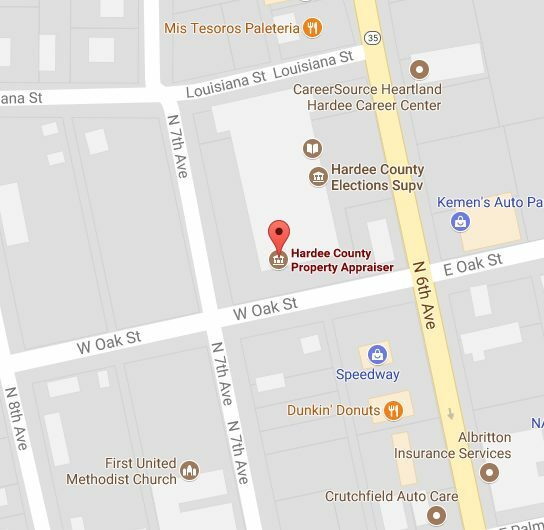 Tax bills are mailed by the Hardee County Tax Collector. Deadline to establish permanent Florida residency for Homestead purposes.